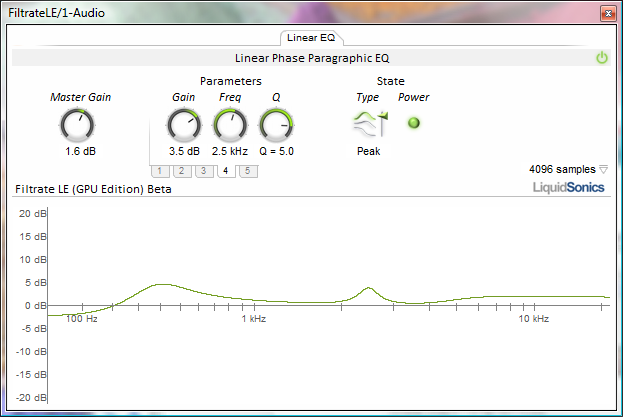 LiquidSonics’ Filtrate LE is a reduced version of Filtrate and provides a linear phase 5-band paragraphic equaliser. It is available in a standard CPU edition and a version taking advantage of NVIDIA CUDA for the main convolution processing tasks reducing CPU usage where a G80* and above compatible card is found in the system. Note that Filtrate LE is available for 32-bit PC VST only. * The GPU Edition Requires NVIDIA GeForce 8 series and above for CUDA support. Compute Capability 1.1 is required to run the GPU Edition which excludes some GeForce 8800 series cards (i.e. those based on the G80 architecture). All other CUDA enabled cards are thought to be compatible but neither system or device compatibility is guaranteed. Correct operation of the GPU edition is highly dependent on a valid CUDA install by the user and no guarantee of compatibility with any card, system or configuration can be provided. Filtrate LE is provided free of charge. If you enjoy using Reverberate LE we encourage you to donate to a charitable cause such as our preferred charity Cancer Research UK. A full user manual is included in the installation.